Guten Tag everyone! We greatly apologize for the delay, we know a lot of you rely on the blogs to keep up with family and friends. The hotel we stayed in during our visit in Dresden had very spotty wifi and we could not send this blog post to Mark Carr, MYO Media Specialist, until the end of day five. Our day today started just like our day yesterday…a wonderful breakfast buffet in Berlin with our closest friends on tour. However, today we checked out of the hotel and began our three hour road trip to Dresden! Most tour members took a much needed nap and others watched the hills of Germany roll by. We stopped about halfway through our road trip at a rest-stop. The rest-stop was small but offered enough coffee, sodas, and snacks for the lot of us. As we continued on our journey, most people remained awake and played cards, laughed with friends, and generally just had a really fun time traveling together. When we arrived in Dresden, everyone was super anxious to get outside and begin exploring. The city was absolutely gorgeous even from the windows of our bus. Helmut, bus two’s tour guide, led us through the city and towards the city center. On the way there, we saw historical monuments and beautiful architecture we would learn about later in the tour. The guides allowed us an hour and a half to explore and eat lunch today (to my group of friends this meant just enough time to get gelato at the cute place around the corner). We met back up with the guides in city center directly in front of the Martin Luther Statue. This statue was erected in front of a historical protestant church called The Church of Our Lady. Martin Luther wrote his 95 Theses in Saxony, the same state Dresden is located in. The large tour bus groups split into 5 smaller groups to receive tours from local guides who know specific details about Dresden’s history. 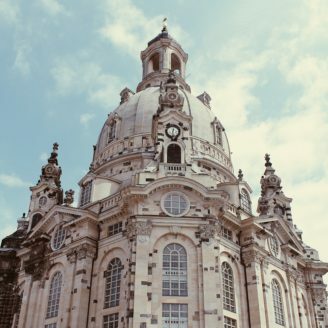 Dresden is the fourth largest city in Germany by area but is only populated by 550,000 people. The Church of Our Lady was completely destroyed during the second world war but has been rebuilt with almost 100% historical architectural accuracy during the last 14 years. This includes the silver organ within the church. Wilhelm Wagner premiered 9 of his 15 operas in the Dresden Opera House. The Kennel Dresden Facade was not built for royalty but rather for parties and housing some of the finest artwork and treasures in Europe. The Grünes Gewölbe Museum houses the largest collection of treasures in Europe and is located in the heart of Dresden. The Procession of Princes Mural in Dresden is composed of over 200,000 individual porcelain tiles. It pictures a procession of every prince to lead Dresden during a set of 800 years, each of these princes are on horseback. Augustus the Strong is the only prince to have a horse whose front legs are leaping off the ground. Augustus the Strong was a favorite prince of Dresden and was idolized by all. After our wonderful tour in Dresden, we checked into our new hotel (with incredibly spotty wifi) and prepared for our concert. The hall was potentially one of the most beautiful I had ever performed in. It was called Kreuzkirche. The echo of the choir voices in this hall was spectacular and filled the room with a warmth no hall had done before. Both the choir and orchestra rehearsed our shortened setlist for the performance due to the church’s specifications of an hour and fifteen minutes as our maximum time to be spent in performance. At 6:30, we headed into the backstage area as guests, shadow tour members, and friends filled the pews excited to hear our music. The concert began at 7 PM. The choir performed first. As we walked out on stage, we immediately noticed the massive amounts of people in attendance compared to our first concert. (Shoutout to Sydney Flem for a beautiful solo in Amazing Grace.) The choir received a standing ovation after The Awakening and The Storm is Passing Over. The orchestra performed next and stuck to their shortened setlist. Their performance was absolutely spectacular despite the shorter nature of this concert. Soon enough, the choir was invited back on stage for America the Beautiful. After this song, the audience demanded an encore. So, the orchestra played the Radetzky March while the choir remained on stage to conduct the audience in the clapping sections of the piece. The choir then exited the stage. The audience, however, was not quite satisfied with our exit. There were two more encores after the march and the concert wound up lasting two hours. It was the most fulfilling feeling to know our music had made such an impact on the audience that they really would not let us leave. Thankfully, when we got back to our hotel, the dinner buffet was still open. It was an amazing spread complete with potentially the best dinner rolls to ever exist and chocolate mousse for dessert! I was in heaven. As we headed back upstairs, the woman who ran the concert at Kreuzkirche bumped into us in the hallway and explained to us that there was over 800 people in attendance and that the church made over 2,500 Euro in donations, the largest donation they had ever received after a concert. The fulfilling feeling of truly being loved by an audience was rekindled and allowed all of us to have a wonderful sleep and be rested for yet another journey ahead. Tomorrow we’re off to Prague!